To all my fellow Canadians, hope you had a great Canada Day!! My friend and I were able to catch the fireworks in Airdrie which were quite spectacular and much easier than trying to see the fireworks in Calgary. I had a whole day off for Canada Day and my family is away at the family cabin, so was I productive? Heck no, I took some TLC time for myself and caught up on a few good TV shows that had been collecting on my PVR. Lately I have been feeling a little unmotivated to bake and cook, which is horrible because I love being in the kitchen. To get myself on the go again, if anyone has any recipes they would like me to try to adapt to be gluten free or any recipes you want to pass on, email the recipe to me at allsweetness21@gmail.com and I will do my best make something delicious and gluten free. I was however motivated to make some delicious bread this past week, it was one of my best bread recipes yet if I was to toot my own horn. A couple reasons why I was motivated was that first off we had run out of bread in our house and secondly I always love to take recipes I have made before and tweak it a bit to try to make something new. 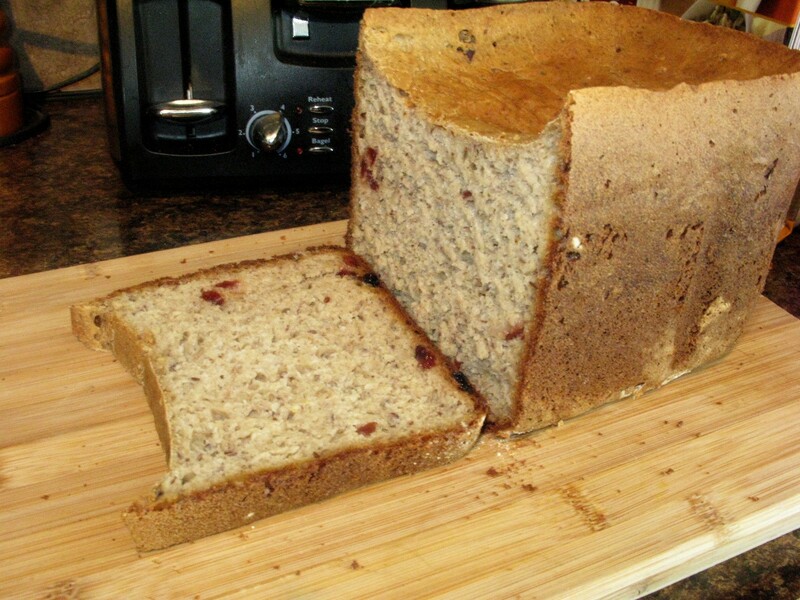 I have made raisin cranberry bread previously, but never before with the addition of bananas. This was a winning combination as the bread was super moist and did not last very long in our house, so look forward to some more bread recipes soon as I am once again out of bread! 1. Place 3 egg white in a bowl and mix with an electric mixer on medium for 2-3 minutes until soft peaks form. Set aside. 2. In another bowl, combine the whole egg, maple syrup, canola oil, bananas, cider vinegar, and water. Mix well to incorporate and pour into the bottom of the bread machine bowl. 3. Scrape egg whites on top into the bread machine bowl. Do not mix them in with the other ingredients. 4. In another bowl combine all remaining ingredients except the yeast. Mix together and pour into the bread machine bowl. 5. Make a well in the top of the dry ingredients in the bread machine bowl and add the yeast or as directed by your bread machine manual. 6. Set your bread machine to a 2lb loaf and medium or dark crust. 7. While ingredients are being mixed by the bread machine, make sure to scrape the sides of the bowl to make sure all the ingredients are incorporated. 8. Once the bread machine indicates that the mixing phase is complete, remove the paddle from the bread machine. This prevents having a large hole in the bottom of your loaf. 9. Allow bread machine to rise and bake. 10. Remove bread and allow it to cool before cutting. Truth be told, we did not let is cool completely before we had to sample it as it smelled so good. However, I find with gluten free breads that if you let them rest for a bit they seem to be easier to cut, but if you cannot resist, dive in and enjoy!